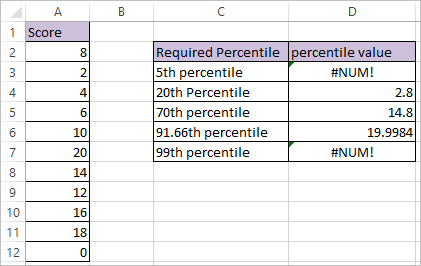 PERCENTILE.EXC Function can be able to interpolates the values only when the k > 1/(n+1) and K< n/(n+1) where n is the number of elements in the array. In our example n=11 and PERCENTILE.EXC Function can be able to interpolates the values when k > 0.0833(8.3 %) and k < 0.9167 (91.67%), so first and last example results in #NUM! error. 20th,70th and 91.66th percentile are calculated with PERCENTILE.EXC Function.